The reigning World Champion claimed after pre-season testing that Ferrari were around half a second ahead of the Silver Arrows, yet the Mercedes pair dominated in the season-opening Australian Grand Prix. The tables would turn in Bahrain though, as the Scuderia enjoyed a distinct advantage over the entire weekend and would have claimed victory if not for Charles Leclerc’s engine problems. This, in Hamilton’s mind, shows why Mercedes were so concerned after testing and proves that they weren’t sandbagging as some had claimed. “We were outperformed [in Bahrain],” Hamilton told Motorsport Week. “We were surprised in the first race. I hear whispers that people think we were sandbagging or not telling the truth or all those things. We said it how it was. “When we went to the first race we truly believed… I was presented where everyone’s positions were [after testing] and from our estimates and understanding of potential fuel loads and power modes and all these things we were behind from three to five tenths. “And we got to the first race and they [Ferrari] didn’t have any pace all of a sudden. “We came out of the first race incredibly surprised and really, really happy to have had such a great result as it had been a hard winter for the team, as it is everyone, and we came to Bahrain. “We are happy [with the win], but we are also conscious and aware of how lucky we were to come away with a 1-2. “We all worked so hard through the weekend, as we do every weekend, but we underperformed. “Naturally you have lucky weekends. We have to go away and take the points and be grateful for them as you never know when at some stage it’s flipped and we have an unfortunate weekend. 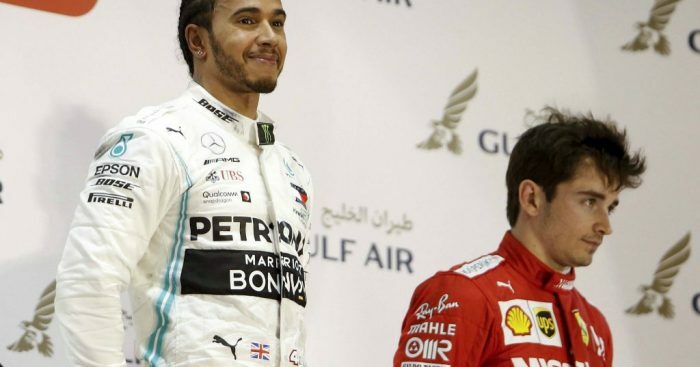 Hamilton, who trails team-mate Valtteri Bottas by a point in the early Drivers’ Championship standings, lost places at the start again in Bahrain, and this is something the Brit will look to put right. “I’m just going to keep working at it,” he said. “Basically you stumble, fall, get back up. Just keep pushing. “I go away from the weekend feeling we worked really hard and made some good steps with the set-up through the weekend, moving in the right direction.